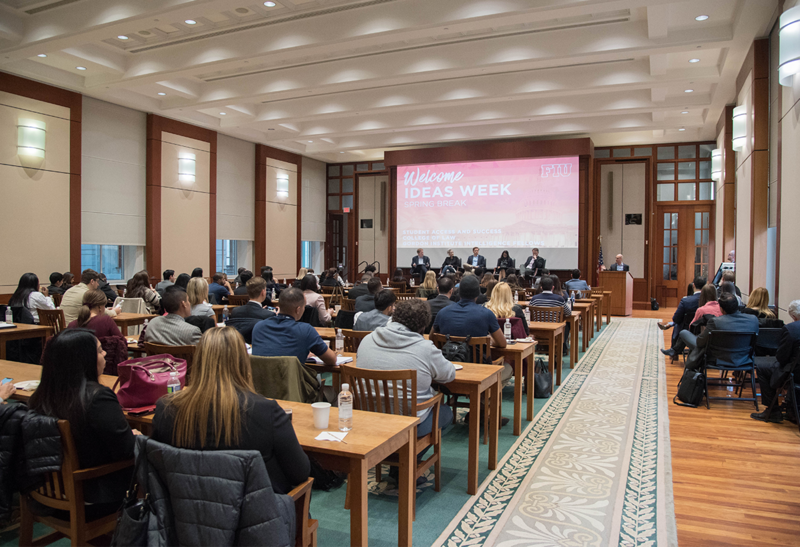 D.C. update: IDEASWeek 2019 opened doors of opportunity for FIU students and sparked conversations on blockchain and the future of the workforce on the same week the White House released its budget request. 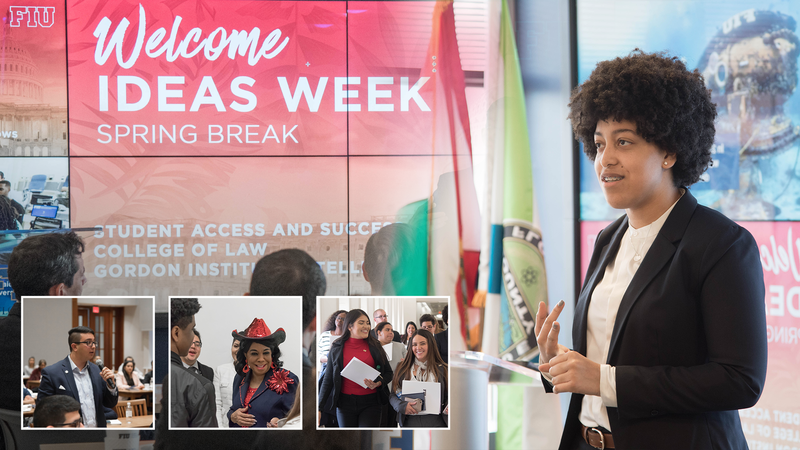 Nearly 100 students spent their Spring Break in the Talent Lab at FIU in Washington, D.C., exploring career opportunities and the biggest ideas in government, industry and technology. During six career-driven days, students from the Jack D. Gordon Institute for Public Policy, College of Law and Student Access & Success(SAS) visited federal agencies like the Securities and Exchange Commission and the CIA, think tanks such as New America, and the D.C. offices of major companies like Ford. “It was a great experience to meet and be heard by some of our Congressional delegation and to know that our representatives are working on behalf of students to expand college access,” said Daphna Jimenez, a SAS student. At FIU in DC, the student groups were exposed to speakers and panelists from the Washington-area alumni network and local recruiters representing Google, the National Counterterrorism Center and National Geographic. For the tenth year in a row, the Gordon institute co-sponsored an interactive war gaming exercise with Intelligence Fellows. Because no trip to Washington would be complete without a substantive experience on Capitol Hill, students benefiting from FIU Fostering Panther Pride and Golden Scholars programs attended a House Committee on Education and Labor hearing on public education and met with Congresswomen Donna Shalala and Frederica Wilson and the Office of Karen Bass-CA. All three student groups also convened for a discussion on blockchain’s impact on their career paths, hosted in partnership with Gallup. Moderated by Ian Wallace, co-director of New America’s Cybersecurity Initiative, panelists — representing law firms and a Congressional office — fielded questions on why emerging professionals in all fields need to understand the decentralized, verifiable ledger system best known for powering cryptocurrencies; the technology is also being used to facilitate “smart contracts” in the legal world, for example. All panelists agreed on one piece of advice: learn to code. Coming to Washington, D.C., for a summer internship? Fill out this form to receive more information on FIU’s professional development programming via the Talent Lab at FIU in DC for summer interns. This week, the White House released a set of 10 priorities for the reauthorization of the Higher Education Act, including reorienting accreditation toward student outcomes; better aligning partnerships between higher education and employers; increasing institutional accountability; accelerating program completion, including prior-learning assessments; and simplifying financial aid. Last week, also marked the start to the 2020 appropriations process as President Trump released his budget proposal to Congress. Although Congressional appropriators, including a House controlled by Democrats, hold the power of the purse and determine spending levels, many of the president’s proposals conflict with the university’s funding priorities. The White House called for a $7.1 billion cut to funding at the Education Department, asked Congress to eliminate Public Service Loan Forgiveness and subsidized student loans, and streamline income-driven repayment programs for student borrowers. It also called for cuts to scientific research, including a 9 percent for the National Science Foundation and 12 percent for the National Institutes of Health. FIU research benefits from federal investments in financial aid and all federal research agencies. FIU will continue to work with the South Florida delegation on the university’s funding priorities. Also last week, the House Education and Workforce committee held a hearing on the cost of college with two local members of Congress, Frederica Wilson and Donna Shalala, who relayed examples from Florida and FIU in their testimony on addressing the overall cost to students, including transportation and housing. Both took the time to meet visiting IDEASWeek participants during the hearing.